Some of the administrator's supporters in Congress and the White House are beginning to waver in their defense of him. 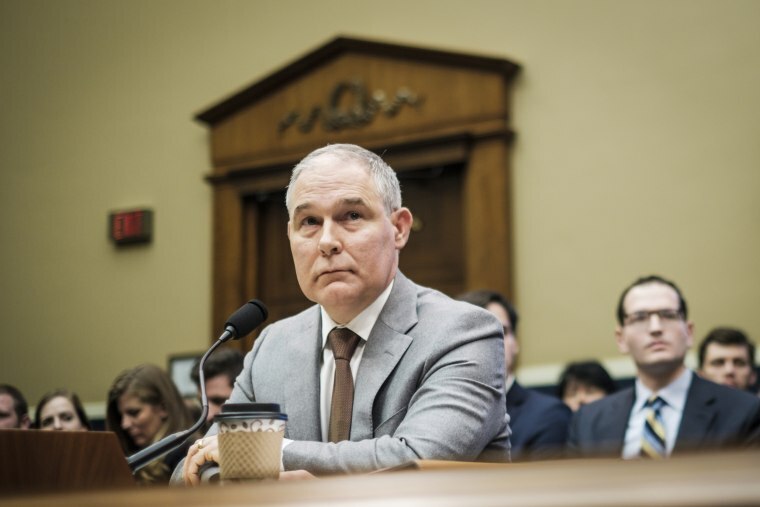 WASHINGTON — Supporters of embattled Environmental Protection Agency Administrator Scott Pruitt are starting to raise questions about his alleged ethical lapses, a shift in tone that could spell trouble as he appears before Congress Thursday. After a string of stinging revelations detailing excessive expenditures on security, travel and raises for staff, Pruitt can expect to be grilled and called to answer for his decisions. But while he will be answering questions from two separate House committees, the person whose opinion will matter most is President Donald Trump. Pruitt's performance could accelerate the potential for his departure from the agency, but it could also help to endear him to the president and congressional Republicans who have thus far have been reluctant to criticize the administrator because of his work to slash regulations and roll back federal rules. Pruitt has few allies left in the West Wing but the president is "committed" to Pruitt, one administration source told NBC News. That could change, the source said, if a media onslaught becomes "too heavy a burden." Still, the White House has yet to provide the public with a sure sign of confidence. White House Press Secretary Sarah Huckabee Sanders said on Wednesday that they are "evaluating" the allegations and expect him to have answers for any questions that arise. Republican leaders and administration officials have expressed concerns about how difficult it would be to go through another confirmation process with a new nominee should Pruitt resign. As the Oklahoma attorney general fighting the EPA, Pruitt’s confirmation 14 months ago was contentious and he was barely confirmed, winning the support of just 52 senators. Republicans in Congress and the administration say privately that the confirmation of the second ranking official at the EPA, Andrew Wheeler, earlier this month has relieved some pressure to defend Pruitt. Wheeler could serve as acting administrator should Pruitt be removed. Meanwhile, NBC News obtained a 23-page document on the eve of his testimony defending Pruitt and attempting to dispel the allegations against him. The document defends his use of first-class travel, enhanced security, a low-cost room he rented from a lobbyist and his use of four email addresses. Pruitt is scheduled to testify before an Energy and Commerce subcommittee and then a House Appropriations subcommittee on Thursday, making for a day of potentially explosive and high-stakes showdowns. “The fireworks will be going strong,” Sen. Jim Inhofe, R-Okla., said with a laugh. Inhofe has imprinted his stamp on the EPA. He helped to usher Pruitt, a fellow Oklahoman, into the job, and his former top aide is Pruitt’s chief of staff. Still, Inhofe notably is leaving the door open for withdrawing his support. “I give him the benefit of the doubt today,” said Inhofe, who noted that he doesn't think the allegations are all true. “Now if (the allegations) were true, you bet I’d be concerned," he added. In his prepared testimony, Pruitt doesn’t mention the controversy surrounding him, instead he focuses on policy and his efforts to reduce the size of the EPA. “Congressional Hearings are an opportunity to reiterate the accomplishments of President Trump’s EPA, which includes: working to repeal Obama’s Clean Power Plan and Waters of the United States, providing regulatory certainty, and declaring a war on lead — all while returning to Reagan-era staffing levels," Jahan Wilcox, EPA spokesman, said. But one line of Pruitt's testimony could be scrutinized by Democrats who are expected to focus their questions on the swirl of controversy. “As careful stewards of taxpayer resources, we will examine our programs for those that are unnecessary, redundant, or that have served their purpose,” Pruitt is expected to say. "I would like to know how you can have confidence in somebody like this in being the EPA Administrator," Rep. Debbie Dingell, D-Mich., said. “There’s many questions that need to be answered and the public has a right to know those answers,” Barrasso told NBC News. Barrasso has requested the EPA hand over documents pertaining to Pruitt’s expenses and his use of four email addresses. Pruitt has enjoyed the backing of many Republicans because they support his policies, including starting the process of rolling back a litany of environmental regulations, something the president has also pointed to in his defense. But the ongoing drip of controversy surrounding the administrator has weighed on Republicans and a president who promised to “drain the swamp.” Elevating the seriousness of allegations was a report by the Government Accountability Office that found that Pruitt violated EPA policy by spending far more than the $5,000 allocated to redecorate his office. Construction for a soundproof booth alone cost $43,000, the GAO found. Rep. Kevin Cramer, R-N.D., who is in a tough race for the Senate and a member of the Energy and Commerce Committee where Pruitt will testify, said that he wants Pruitt to address the controversy at the hearing. "What I would like to see from the administrator, frankly, is some contrition and admission that there are some things that have gone too far, if he believes that, and a plan for improvement,” Cramer said. As Trump is cycling through cabinet and high-ranking officials, drama with Pruitt comes as other nominees are struggling to make it through the Senate. Secretary of State nominee Mike Pompeo will receive the least support of any Secretary of State in a confirmation vote on Thursday, CIA Director nominee Gina Haspel has bipartisan opposition and Veterans Affairs nominee Ronny Jackson is embroiled in alleged scandal. Cole said that while Pruitt’s performance will be important to clear his name, it will really be an opportunity to speak to the president.